Rockstar Energy Suzuki Europe encountered a big and buoyant crowd at Arco di Trento for the Grand Prix of Trentino and the first European round of the 2014 FIM Motocross World Championship as Glenn Coldenhoff again put his works RM-Z250 in the mix by taking third position overall and his third podium result in a row – after racing to victory in the second moto. In cool but bright conditions, 25,000 fans packed into the small spectator zones around the slick but immensely-bumpy Italian hard-pack as MXGP thundered into life in the shadow of the epic mountains alongside. Team-mate Jeremy Seewer also maintained his superb progress in MX2 with his best result to-date and actually fought for the lead in the first moto of 30 minutes and two-laps duration. Arco was a head-scratcher for the riders. The presence of four racing classes around the short and busy layout created a choppy and unsettling terrain and the curving nature of the track meant that overtaking was not an easy task for the multitude of MX2 racers setting similar lap-times. The team came to Italy fresh after back-to-back podium finishes and with Coldenhoff just two points away from the championship top-spot. The Dutchman took to the start gate with the 13th-pick after becoming tangled in a first-corner pile-up during the MX2 Qualification Heat that saw him having to come through the pack from last position. It was a scenario he did not repeat for the first moto sprint of 30 minutes and two-laps on Sunday although the former GP winner did have his work cut-out. He pushed through from the lower regions of the top-10 and although he relegated Romain Febvre to take seventh on the last lap, an off-track excursion was costly and he rolled-over the finish-line back in eighth spot. A few technical changes to the bike were beneficial for ‘#259’ in the second moto as he tussled with Valentin Guillod for the lead and then set a pace to pull clear of the Swiss and register his second career chequered flag in as many meetings. Coldenhoff is now just six points off the lead in the MX2 FIM World Championship. A small slip in the qualification heat meant that Jeremy Seewer missed-out on a potential top-five slot but nonetheless entered the gate with an encouraging seventh place. The Swiss was electric in the first moto and was part of a multi-rider group jostling for podium places. The ‘#91’ was even disputing the lead at one point and looked comfortable marking lap-times to set the pace. In the second half of the moto he eased his rhythm to ensure a decent finish and collected fifth at the line. Later in the afternoon Seewer was at it again in the top 10 and only some hesitation in his battle with Mel Pocock prevented the youngster from rising higher than ninth. Seewer was eighth overall and is 12th in the MX2 points table after just four events as a full-time member of the field. Julien Lieber suffered a crash on Saturday and his subsequent DNF meant he was last into gate on Sunday; a significant disadvantage for the GP motos. From this setback the young Belgian again hit the deck in the first affair and had to pull-out with a significant amount of damage to his RM-Z250. He also required six stitches to a wound around his knee and ‘#33’ was forced to abstain from the second race. The distinctive yellow and black team awning was full of a different sound this weekend as Brian Hsu fired-up his RM125 for the first round of eight in the European EMX125 competition. The teenager – in his second season in the class – was fourth overall with finishes of 10th and second. 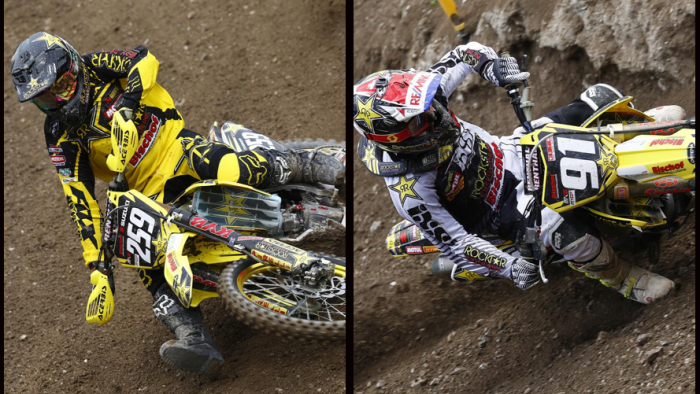 Rockstar Energy Suzuki Europe will head directly to Bulgaria now for the fifth Grand Prix of 18 on the 2014 slate. The following week they will have a respite from international duty but will begin its domestic campaign with the first round of eight in the German ADAC MX Masters series at Drehna. MX2 World Championship Standings (after 4 of 18 rounds): 1. Arnaud Tonus (SUI, KAW), 154 points; 2. Glenn Coldenhoff (NED, Rockstar Energy Suzuki), 148 p.; 3. Jeffrey Herlings (NED, KTM), 144 p.; 4. Romain Febvre (FRA, HUS), 126 p.; 5. Dylan Ferrandis (FRA, KAW), 118 p.; 6. Jordi Tixier (FRA, KTM), 107 p.; 7. Aleksandr Tonkov (RUS, HUS), 107 p.; 8. Jose Butron (ESP, KTM), 100 p.; 9. Valentin Guillod (SUI, KTM), 95 p.; 10. Tim Gajser (SLO, HON), 93 p.; 12. Jeremy Seewer (SUI, Rockstar Energy Suzuki), 75 p. 19. Julien Lieber (BEL, Rockstar Energy Suzuki), 32 p.